We all know how much electricians are needed pretty much everywhere, from schools to businesses and from hospitals to homes and Massachusetts is home to some great electrical companies. Perhaps you have thought about learning and working in this useful trade. Maybe you want to know how you could go about becoming properly educated as an electrician and practicing in this field in the state of Massachusetts! If so, this article is for you. Read on about how you can become an electrician and work in a trade that offers strong job security and more than respectable wages. Electricians carry out the installation and maintenance of electrical systems, and make repairs to those systems. Electricians work with power, control, lighting, and communications systems. 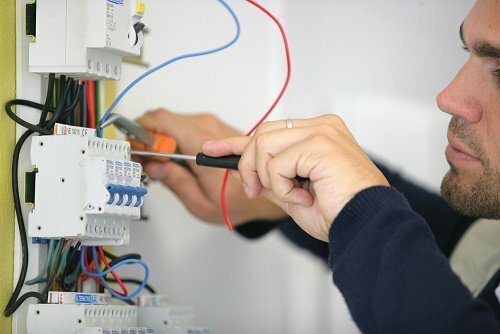 Electricians are responsible for many different duties and tasks. Electricians must properly read and accurately decipher technical diagrams and blueprints. They must carry out inspection of electrical components, such as circuit breakers and transformers. Electricians in Massachusetts will install lighting, wiring, and control systems, and must maintain those systems. These tradespeople utilize testing devices to identify problems with electrical systems, and use power tools and hand tools to replace and repair fixtures, equipment, and wiring. Electricians sometimes direct and supervise workers in carrying out electrical work, and train workers in the trade. In everything they do, electricians must ensure that they act in accordance with local and state building regulations, and the National Electrical Code. It is very common for electricians to work alone. However, collaboration does sometimes occur. An example of collaboration is when an electrician who is working on a building site collaborates with architects and building engineers. An electrician who works for a large company will probably work as part of a team. Some electricians choose to focus on a specialty. One example of such an electrician is the lineman electrician, who installs the transmission and distribution lines necessary for electricity to travel from the source to customers. Another example is the residential electrician, who focuses his or her practice on electrical systems in homes. They may work on new homes that are being built or in existing homes. A third example of a specialized electrician is the inside electrician. The inside electrician repairs and maintains business and factory control systems, equipment, and large motors. All the movement required in being an electrician is better for your health than the constant sitting you would do if you worked in an office. This is one of many advantages offered by this dynamic and fascinating trade. Where Do Electricians Work in Massachusetts? Electricians work in many different places, such as construction sites, factories, homes, and businesses. Electricians sometimes have to work both indoors and outdoors. It is common for these tradespeople to have to travel to various worksites. Electricians must be willing to sometimes work in cramped, possibly uncomfortable spaces, and must be ready to spend a great deal of time kneeling and standing. If you work in a factory, you will probably need to wear hearing protection to deal with a high level of noise. The weather might often affect your working conditions and environment. You might need to work in parts of buildings that are not properly climate controlled (or not climate controlled at all) in very hot and very hot weather. What Qualities Do I Need for a Successful Career as an Electrician? •	Strong analytical and critical thinking abilities, and problem-solving skills: These skills are essential for the electrician to consistently and successfully identify problems and the most effective ways to solve them. This area involves troubleshooting skills. •	Full ability to see color: Electricians must have this ability, as electrical wires are often identified by color. •	Customer service skills: It is essential for electricians to have customer service skills, as they often have to directly deal with customers. •	Business skills: Business skills are especially important for electricians who are self-employed or hope to be self-employed one day. •	Ability to work independently: Electricians often work alone, and need to have strong independent work skills and habits. •	Math skills: You will need to feel comfortable working with math and learning new mathematical concepts and processes in order to be an electrician. The math used by electricians is more complex than simple math. You will get used to using it, however, especially when you actually begin to use it in the field and put it into practice. If you are still in high school, make sure to take as much math as you can and to study hard. You will never be bored working as an electrician! Each day is different and presents new challenges. Being an electrician is also a highly respected job, as the level of skill and knowledge required to practice in this field is widely known. How Can I Become an Electrician in Massachusetts? In order to become an electrician in Massachusetts, you will need to complete an accredited education and training program at a technical college or electrician training school, as well as an apprenticeship. Completing both of these steps is necessary for you to receive state licensing to practice as an electrician. Education programs usually require a high school diploma or equivalent for entry. In your educational program, you should learn about electrical code requirements, mathematics, electrical theory, safety and first-aid practices, and blueprint reading. Apprenticeship programs are sponsored by groups such as contractor associations and unions. In order to begin an apprenticeship, you will have to be at least 18 years old, be able to pass a substance abuse screening, pass an aptitude test, have taken at least one year of algebra, and have a high school diploma or equivalent. Your apprenticeship program must be at least four years (8,000 hours) in length. You should be aware that apprentices are required to supply and use their own tools. The electrician supervising your apprenticeship must at minimum have a Journeyman (Class B) license. Licensing to practice as an electrician in Massachusetts is granted by the Massachusetts Board of State Examiners of Electricians. The Massachusetts Board of State Examiners of Electricians is part of the Massachusetts Division of Professional Licensure. Massachusetts offers four different kinds of license: Master Electrician (Class A), Journeyman (Class B), Systems Contractor (Class C), and Systems Contractor (Class D). The Journeyman (Class B) and the System Contractor (Class D) licenses require you to attain at least 70% on a two-part exam. The Master Electrician (Class A) and the System Technician (Class C) licenses also require you to achieve 70% on a two-art exam. Electricians are required to renew their licenses every three years. License renewal has continuing education components. Upon finishing your education and apprenticeship, the first license type for which you will be eligible is the Journeyman (Class B) license. Once you have held your Journeyman (Class B) license for at least one year (during which you worked actively as an electrician), you will be able to apply for a Master Electrician (Class A) license. Note that you will not qualify for the Master Electrician license if all your work has been only in the installation of security systems, fire warning systems, and power limited systems. Many electricians join unions. The largest electricians’ union is the International Brotherhood of Electrical Workers. In the United States as a whole, the median annual salary for electricians is $51,880 (hourly wage is $24.94. During your time as an apprentice, you will begin by earning between 40 and 50 percent of a full electrician’s salary. You have the potential to make more as you progress through your apprenticeship. The median salary for beginning full electricians in Massachusetts varies from city to city, and from town to town. Like tradespeople and professionals in many other fields, electricians may find more opportunities for higher pay in larger cities rather than small towns and rural areas. The median pay for beginning full electricians in Boston, Massachusetts is $48,385 per year. Make sure to remember that this is only the median pay, and that some electricians (especially experienced ones) earn considerably more than this figure. Electricians who work in power generation, manufacturing, and transmission usually make more money than those who work in construction. Union electrician positions usually pay higher wages than non-union ones, but this varies from employer to employer. Electricians almost always work on a full-time basis. They might sometimes have to work on evenings and weekends (this might be quite frequent, depending on where the electrician works), and these tradespeople tend to work overtime quite often. It is quite common for electricians to be self-employed. In fact, 1 in 10 of these tradespeople work for themselves. It is a good idea to become quite experienced in the field before venturing out on one’s own. Many electricians who are self-employed work in the field of residential construction. One advantage of being self-employed is that you may have a greater ability to set your own schedule and hours. The field is growing at a significantly faster rate than the average of other occupations. Two factors contributing to growth in this field are the necessity of properly maintaining manufacturing plant equipment, and the continued development and expansion of the construction industry. Electricians generally have excellent opportunities for career advancement. For instance, an electrician who starts off as a service technician for a company can work his or her way up to becoming a field manager. After that, the positions of operation manager and distribution manager will likely be there for you to strive for. Of course, with positions higher in the company hierarchy come higher salaries and influence within the company. Electricians who want to be self-employed and start their own business are in good company. As we mentioned earlier, about 1 in 10 electricians work for themselves and have their own businesses. If you have this in mind as something you would like to do one day, make sure to take every opportunity you have of advancing your business skills. Being self-employed and running one’s own business is much more challenging than many people realize, and being a self-employed electrician certainly requires a great deal more than the electrician’s already extensive electrical knowledge. Working as an electrician is a job with a high level of job security, especially in comparison with the many precarious jobs available in today’s economy. It is even especially stable when compared to other trades. The need for electricians is something that no business or home can avoid. If an electrician is needed, he or she is needed, and there is really nothing one can do to avoid calling in an electrician to carry out whatever repairs, maintenance, or installation needs to be done. Once you become an electrician, it is very unlikely that you will have to change your career later in life. The vast majority of electricians are able to successfully practice as electricians for their entire working lives. With all of the uncertainty and instability in the work world of today, this is a unique and very attractive feature. Having the ability to stay in the same field for your entire working life will give you the advantage not only of financial stability but also of being able to work your way up the company hierarchy more efficiently. We hope that this article has told you everything you wanted to know about becoming an electrician in Massachusetts, and that you have decided this just might be the trade for you. Some great trade schools are found in major cities in Massachusetts so finding one is easy. We have listed a few to make sure you research before making your decision to enroll. Their instructors have over 15 years of experience working as electricians which is a big advantage to you as a student. The school is approved for the training of Veterans and services Eastern Massachusetts. The Journeyman electrician course is 600 hours. Contact the school at 130 Kerry Place Norwood, MA 02062. The electronics technician program consists of 3 modules. You can earn your certificate in less than a year and Bay State School of Technology is a military friendly school. They will train you to take the National Service Certification test offered by ISCET. They are located at 225 Turnpike Street Canton, MA 02021 just off Randolph St. and 138. WES offers a 600 hour journeyman class and master electrician class. They are located at 500 Salisbury Street Worcester, MA 01609. They offer a payment program and no interest loan so contact the school today for more information. One of the great things about the electrician field in MA is the close proximity to major cities in other states. The vast number of electricians are found in Canton, Chicopee, Woburn, Worcester, Boston and Springfield. What that means to you if you are in those areas is you’ll have an easier time finding employment after graduation but if you want to work in a more rural area you’ll still have a big advantage. Location: Rural areas aren’t as attractive in terms of population density however as an electrician if you career goal is to own your own electrician company and work independent then you’ll find rural areas very attractive. Salary: One thing that attracts more people to this career is the salary one can make. Not only can you make good money but the opportunity for advancement is unlimited in the industry. Many start out an entry level electricians then move into management. Some even decide to work in a corporate office managing other field electricians.